Certified organic, whole, pure, and micronized: chlorella, cilantro, PolyFlor™ probiotics, and 18% grain neutral spirits as a preservative, agaricus blazei mushroom, reishi mushroom, cordyceps mushroom, milk thistle seeds and horsetail for drainage and organ support. Purchase this product now and earn 6,845 Reward Points! It is an unfortunate fact of modern life that heavy metals exist in our water, air, food and dental fillings, and that these toxins are absorbed into the body’s cells. Mercury, aluminum, cadmium, nickel, cobalt, uranium, lead, thallium, arsenic, etc. are all toxins that can result in debilitating and chronic illnesses for millions of people. Some adults and children have the requirement of additional immune system and gastro intestinal support, NDF Plus™ was formulated in clinic to address these patients. NDF Plus™ is a dietary supplement that increases the excretion of heavy metals and chemicals, specific for individuals with assimilation and utilization issues, and chemical sensitivities. These toxins are excreted primarily through the kidneys reducing reabsorption in the bowels. The chlorella cell wall in NDF Plus™ is a mucopolysaccharide (non-metal) ion exchange resin (M.I.E.R); it forms both ionic and double bonds with toxic heavy metals and chemicals in the body. 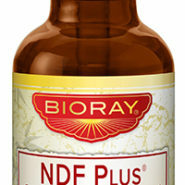 It is a safe, effective heavy metal detoxifier that moves metals out of intra and extra cellular spaces. Using a proprietary manufacturing process, the active ingredients in NDF Plus™ are suspended in liquid, assuring rapid absorption and 100% bioavailability. Adults: Start with 1 to 3 drops once a day in 10 ounces of filtered water on an empty stomach. Increase dose by 1 to 3 drops every week. Gradually increase dose up to 52 drops (2 droppers full) twice a day. Individuals with amalgam fillings should brush the entire oral cavity with 4-10 drops of NDF Plus™, spit and rinse before taking the dose of NDF Plus™. Sensitive individuals may want to start with one drop and gradually ramp up the dose. Supervision by a physician is recommended. If pregnant or nursing consult your health care practitioner. Children: Initial children’s dose is 1 drop, once a day, in 4 ounces of filtered water or diluted juice on an empty stomach. Increase by 1 drop every two weeks up to 1 dropper full. Once the dose reaches 5 drops, 2 times a day, and the child has finished 1 bottle of NDF Plus™, NDF™ can be added, by 1 drop every 2 weeks, to the existing dose of NDF Plus™. The maximum dose is 1 dropper full of NDF Plus™ and 1 dropper full of NDF™.